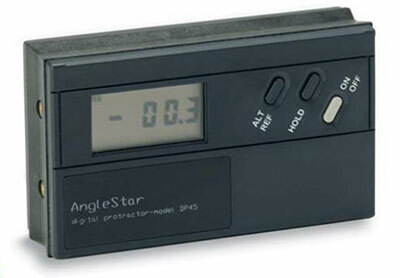 The AngleStar® DP-45 Digital Protractor is a handheld, portable angle measurement instrument. Consisting of a rugged electronic sensor, custom circuitry and liquid crystal display, this easy-to-use device provides instant digital display of the angle, eliminating the interpretation errors associated with bubble levels and mechanical protractors. The AngleStar® Protractor System (APS) is a ready to use, stand alone system for angle measurements. The system incorporates a special AccuStar I ratiometric electronic clinometer, a digital LCD display, and a four foot interconnecting cable (cable lengths up to 200 feet are available, consult factory for details).